This can increase the amount of storage space available by up to 50%. 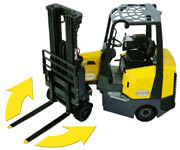 The Aisle-Master Very Narrow Aisle forklift is designed to work both inside and out, and can do the work of both reach and counterbalance forklifts for quicker operations. This reduces the number of trucks needed and cuts costs. 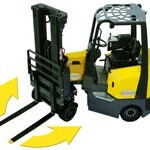 Electric and LPG powered models are available with lift capacities of up to 2.5 T.